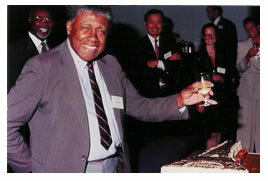 The Minority Medical Faculty Development Program (MMFDP) was renamed in January, 2004 in honor of Harold Amos, Ph.D., who was the first African-American to chair a department, now the Department of Microbiology and Immunobiology, of the Harvard Medical School. Dr. Amos worked tirelessly to recruit and mentor countless numbers of minority and disadvantaged students to careers in academic medicine and science. He was a founding member of the National Advisory Committee of the MMFDP in 1983, and served as the Program’s National Program Director between 1989 and 1993. Dr. Amos remained active with the program until his death in February, 2003 at age 84. 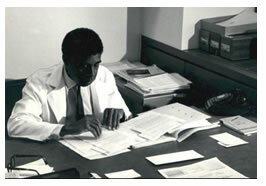 Harold Amos earned his undergraduate degree from Springfield College in Massachusetts, and went on to earn a Ph.D. in Microbiology from Harvard in 1952. After spending time at the Pasteur Institute in Paris on a Fulbright scholarship, he joined the faculty of the Harvard Medical School, where he remained for almost 50 years. He was named the Maude and Lillian Presley Professor of Microbiology and Molecular Genetics in 1975. His research interests centered around bacterial metabolism and animal and bacterial virology. In addition to the Robert Wood Johnson Foundation, he was active with the Josiah Macy, Jr. Foundation and the American Cancer Society. He was the recipient of numerous awards and honors, including the Dr. Charles R. Drew World Medical Prize. He was a member of the Institute of Medicine and a fellow of the American Academy of Arts and Sciences. Harold Amos was a friend to people of all ages, from all parts of the world, from all walks of life. He preferred to travel by train and ocean liner, shunned email in favor of handwritten notes, but otherwise embraced technological advancements. He collected paintings and prints by emerging artists. He could spend hours in an antiquarian bookstore. He was a lifelong Francophile. He loved good food, good wine, and above all, good conversation. It is hoped that the memories of his generous spirit and gentle nature will help to guide this program for many years in the future. 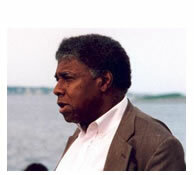 For information about Harold Amos’ life, go to the Benjamin Banneker Institute for Science and Technology. 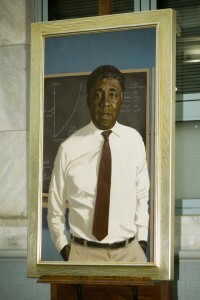 A portrait of Harold Amos was unveiled at a ceremony at the Harvard Medical School in October, 2007. Photo © 2007 President and Fellows of Harvard College on behalf of HMS Media Services, All Rights Reserved. Photo by Liza Green.